A brilliant design showcases a penthouse space. 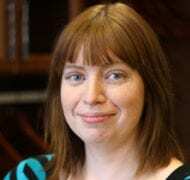 Heather has worked with California Closets in two cities, in both support and design roles, for over 8 years. She loves solving challenges with design solutions and having the opportunity to sell a product she truly believes in with integrity and confidence. Describe the clients and the style of their home. The aesthetic of the building was quite unique, incorporating both luxury and industrial elements. 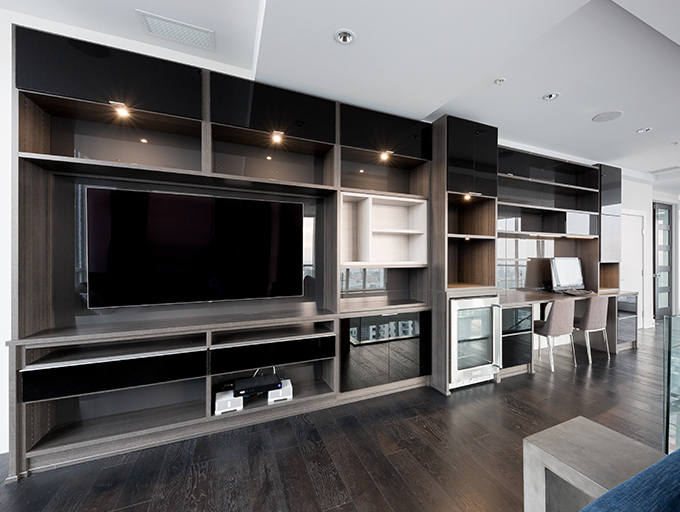 My client was a top executive at the building corporation and planned to sell the suite so these custom systems needed to accommodate and attract a wide range of potential urban buyers. We decided to use dark finishes and reflective surfaces to create a striking juxtaposition to the penthouse's magnificent large windows and combination of white and raw concrete wall areas. How did you collaborate to create the best possible outcome? Our whole team came together on this complex project. My client really wanted crisp lines, but with an edgy, industrial quality. I achieved this look by integrating high-gloss finishes paired with matte aluminum hardware, and incorporating accent lighting. I used our Classic and Virtuoso lines to achieve an arresting, modern design that also maximizes available space. Since this space was commissioned by the owner of the building company, I had to work within his tight schedule and with a high level of autonomy to produce the designs he envisioned. How would you describe the final result? 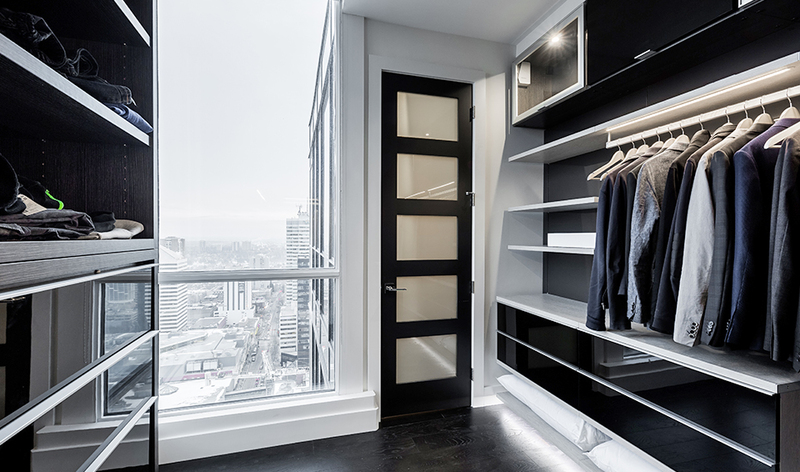 This unique, mullti-system project successfully brought together our design and product expertise to make a stunning impact on this 3.1-million dollar condo. Were there special items/collections that the client wanted to design around? The loft unit needed to fulfill many purposes, including modern amenities like a wine fridge and liquor storage, a workspace, and a media unit fit for an extra large TV. 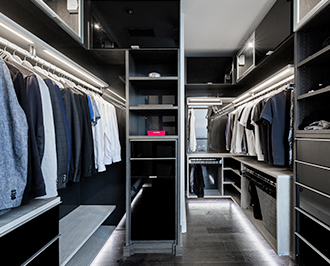 For the closet, my client waned to optimize storage while maintaining an open and airy feel.